Having an in-ground swimming pool installed at your home is the ultimate in luxury and relaxation. The pool area offers fun, enjoyment and memories that will last your family a lifetime. It is important that the pool environment is safe to ensure those memories are favorable ones. The last thing anyone wants to relive is an accident that happens in or around their pool area. One of the best ways to make sure your pool is safe is with an aluminum pool fence. Aluminum fence manufacturers offer a wide range of colors and styles to choose. It is certain that you will find a decorative aluminum fence that compliments the exterior of your home as well as the homes landscaping and area surrounding the pool area. Aluminum fencing is also easily customizable making it the perfect option to suit any size and shape swimming pool. As with all pool safety features it is important that it is installed properly. It is important to select a fence that meets the B.O.C.A. regulations. It is also crucial that the pool’s fence is installed correctly. An area surrounding the perimeter of the pool clear of objects that children would be able to use to help them climb over the fence. This can include such things as retaining walls, boulders, trees or other features within the landscape that can be stepped on to ease access over the fence. 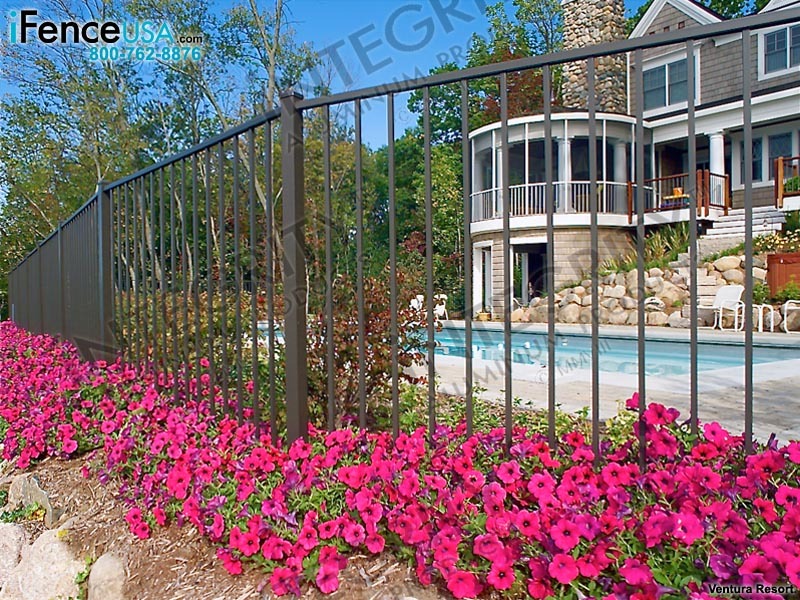 An aluminum fence should be installed so that it completely surrounds all sides of the pool. Some homeowners feel that hedges are enough to properly block children from accessing the area. This is simply not true and is irresponsible. The pool area must be completely enclosed with aluminum fencing. When choosing an aluminum pool fence it is required that the pool is accessible through an entry gate. The gate must be one that swings closed and latches without additional assistance. This is ideal to ensure that the gate is latched helping to prevent accidentally leaving the pool gate open and the water accessible to young children or pets when unattended. Swimming pool safety is of utmost importance to homeowners. Aluminum fence helps to create an environment that does just this as well as being visually appealing. Having a fence in place also helps to keep pets and wild animals away from the pool as well as security against vandals when not in use. This entry was posted in aluminum fencing, pool safety on July 29, 2015 by admin. When it comes to pool safety you can never be too cautious. One of the leading causes of death among children under the age of five is accidental drowning. Thousands of young children suffer near-death drowning injuries each year resulting in debilitating brain injuries from oxygen deprivation. A solid defense against these life changing tragedies is a sturdy aluminum fence. The addition of an aluminum fence along with safety conscious equipment and behaviors can help to prevent almost all accidents that are pool related. Installing a solid aluminum fence is only one of the barriers used to separate children and pets from the pool. It is arguably one of the most important however. When choosing an aluminum fence it is important to purchase and install a fence that meets all B.O.C.A. regulations as well as the regulations set forth by your local government and homeowners associations. The following are characteristics to consider when choosing a perimeter fence to purchase and install around your in-ground swimming pool. Proper Height: The minimum height requirement of pool fencing is forty eight inches (four feet) tall. Decorative aluminum fencing can be purchased in a variety of heights and styles. Taller fences work better of course to deter older and more active children from accessing the pool area unsupervised. Sturdy Construction: The installation of an aluminum fence is permanent. It is not like other less sturdy pool fencing options such as mesh. 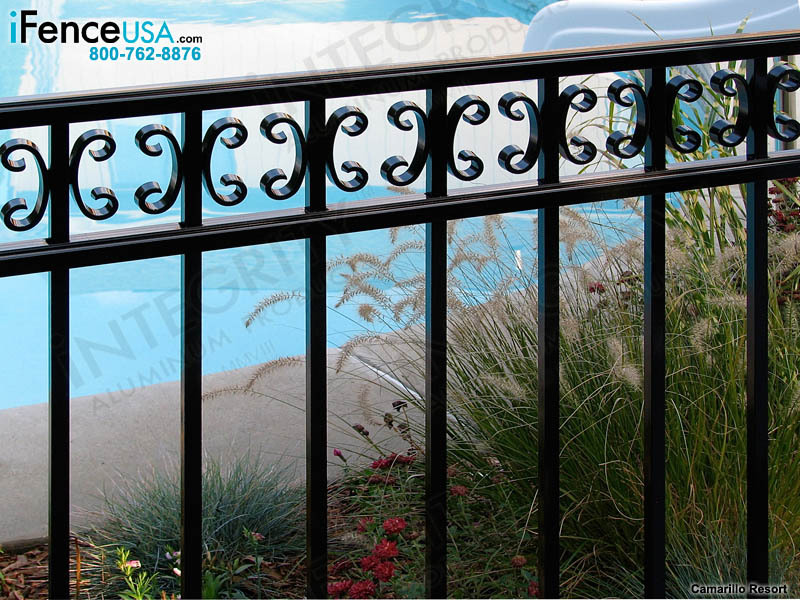 Aluminum is an incredibly durable, sturdy material for fencing and is perfect for the perimeter of a pool. Aluminum is resistant to rust, chemicals and other environmental factors that it can come in contact with around a swimming pool. Another benefit of aluminum pool fencing is the ease of maintenance. No painting or staining is required to keep the fence looking as new as the day it was installed. A Self Latching Gate: It is required that any pool enclosure have a self-closing, self-latching gate as well. Most every style of aluminum fence has a matching aluminum gate designed to compliment it. When installing the appropriate aluminum gate add a padlock or other type of lock, out of the reach of small children as an additional safety feature. Correct Bar Placement: The bar placement on your aluminum fence panels are important as well. The horizontal bottom rail must be less than two inches from the ground. This is crucial to keeping children and small pets from crawling under it in order to access the area. It is also important if the decorative aluminum fence style you have chosen has a mid-rail it required that it is at least forty five inches above the bottom rail. Incorporating the above, as well as the B.O.C.A. pool safety code can all be accomplished with aluminum fencing that compliments the landscape surrounding the pool area. 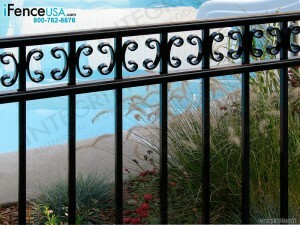 Aluminum pool fences are easily customized as well. A reputable online fence retailer will assist you in the planning, designing, ordering and installing your new aluminum pool fence. This entry was posted in aluminum fencing, metal fences, pool safety on July 29, 2015 by admin. Your yard is an extremely important extension of your home. Your landscaping should be a reflection of the interior and exterior style of your home. In this article we will discuss four basic concepts to use when upgrading your landscape to compliment the improvements to your home. One simple way to increase the aesthetics of your yard while increasing the utility and beauty of the space is to level your landscape. Homes built on an odd slope or cursed with sections of uneven land are not conducive to an active family. When you level the landscape around your home it makes the space ideal for a patio or an area for kids and pets to run around and play. A decorative aluminum fence is the perfect addition in the creation of an inviting yard. Not only is ornamental aluminum fencing appeal visually it is ideal when it comes to protecting your home and family. Installing a durable, maintenance free aluminum fence creates a barrier keeping kids and pets in while discouraging unwanted trespassers from entering the property. With the installation of aluminum fencing homeowners are certain to increase the value of their homes. It is one of the only landscape additions where the expense is recouped with an increase in your homes equity. Adding trees especially shade trees to your yard will help to make your home and landscape more inviting. Not only can mature trees increase the value of your home seven to nineteen percent they add to the visual appeal of your landscape. Shade trees provide a home for roosting songbirds, cover for small animals and a canopy from the sun which helps to keep your home cool during the summer months. Trees add personality and dimension to your space. Trees can be purchased in a variety of variations and sizes. Make sure you chose trees that will flourish in your climate for the most ideal results. Upgrading your landscape with an in-ground swimming pool is almost mandatory in southern states. Here in the north a swimming pool is a luxury addition to your landscape. No matter where your home is located a swimming pool adds a component to the space that nothing else can. A pool adds the feeling of relaxation to any landscape. The minute you step into the space you instantly retreat to the feelings you experience on vacation. The water helps homeowners unwind, slow down and kick back. Your home and landscape will soon be the local sanctuary for your friends and family. The addition of any one or all four of these yard improvements will help to ensure your landscape stays up to date with the improvement to the interior and exterior of your home. This entry was posted in aluminum fencing, metal fences, pet containment, pool safety and tagged aluminum driveway gate, aluminum driveway gates, aluminum fence, Aluminum fences, aluminum fencing, aluminum gates, aluminum pool fence, aluminum pool fences, aluminum pool fencing, aluminum swimming pool fence on July 22, 2015 by admin. As a home and swimming pool owner it is important that you feel your family and friends are as safe in your yard as they are in your home. The pool is an extension of your home and yard. It is important to create a safe environment around the pool that fits in with the natural flow of your home and landscape. This can easily be accomplished with the installation of an aluminum fence around your pool area. There are important requirements that need to be met in order to meet the standards set forth by the Building Officials and Code Administration, B.O.C.A. 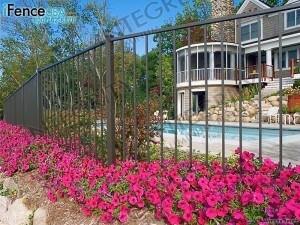 for short when installing aluminum fencing around your pool area. Homeowners also need to research local regulations that are in place as well as any special rules within their H.O.A. Some H.O.A.’s have rules and regulations in place regulating the material or color of fencing used. It is crucial to install an aluminum fence that adheres to all of the requirements set in place while also maintain visual appeal. There are several key elements that must be met in order for an aluminum fence to comply with B.O.C.A. pool safety standards. The aluminum fence that is chosen should be at least forty eight inches tall. If the fence style that is selected has a mid-rail it must be at least forty five inches above the bottom rail. To accomplish this some styles of aluminum fence need to be taller than the forty eight inches in order to meet the B.O.C.A. regulations. In purchasing aluminum fence panels to meet pool safety standards you must look for a style in which the pickets of the fence are less than four inches apart. The space between the bottom rail and the ground must also be less than four inches. Perhaps one of the most important requirements of all has to do with the aluminum pool gate that is used to enter and exit the pool area. In order to meet the B.O.C.A. requirements the aluminum pool gate must be self-closing and self-latching. When the gate is installed it is required to open away from the pool area. As you are entering the pool the gate will open towards you. As you exit the pool the gate will open out. The latch on the gate must be at least fifty four inches off the ground. All of the regulations put on pool fencing are in place to prevent accidents that can occur when swimming pools are accessed when they should not be. This entry was posted in aluminum fencing and tagged aluminum driveway gate, aluminum driveway gates, aluminum fence, Aluminum fences, aluminum fencing, aluminum gates, aluminum pool fence, aluminum pool fences, aluminum pool fencing, aluminum swimming pool fence on July 9, 2015 by admin.